All things considered, it looks like a better set-up. Hope the tractor finds a new home ... it looks pretty cool! The play house conversion is interesting. Lucky chickens! They look pretty happy on the shelves. I like both things - I think the tractor would still be quite useful for little chick(ens) and then they could move into the house when they're grown. Just a thought! It looks great. I bet the chickens are loving it. That reminds me, I need to clean out my shed. I wish I had a pretty coop like you do! This looks really nice. Thanks so much for stopping by my blog today and commenting. 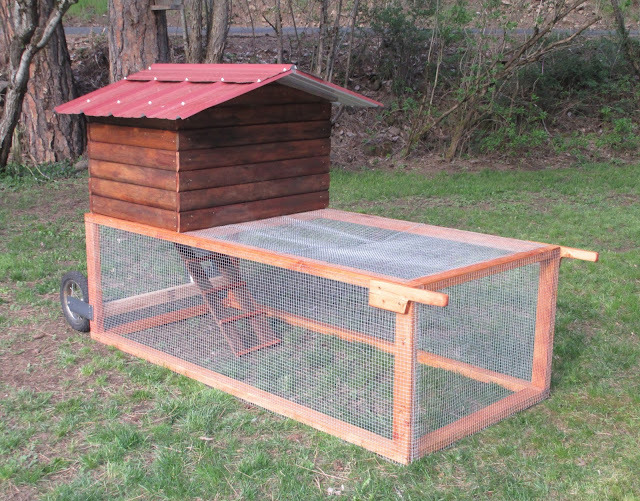 Here I am, visiting your blog, and realizing that you keep chickens too! I'm not sure how anyone can leave their girls in one of those little tractors, especially with the harsh winters that have hit us lately. I am sure they are very happy in their new 'playhouse'. We spoil our girls...perhaps I need to do a post on them! What fun they are. Your girls have got to be so thrilled with this new and spacious abode! Free range chickens are the happiest chickens of all. I just don't understand the chicken tractor thing, unless one lives in a suburban setting it seems so confining. Chickens love to run and jump and play! It looks great! We do the same thing rotating breeds. We currently have barred rocks and cuckoo marans. We usually work on a three year rotation, but last year was disrupted by my injuries. You new coop looks like it would be so nice in cold weather. I bet your girls are very happy!